Our attitudes and beliefs create a magnet to attract events, circumstances and opportunities to live out those attitudes and beliefs. And one of the most powerful tools for utilizing the LoA is making a vision board. Creating a vision board is more than merely cutting out magazine pictures and gluing them onto a board, hoping to attract your desires. A vision board is a powerful LoA tool that helps you narrow down your desires through the power of choice. The tool helps you invest the time and energy to visualize your future and consistently reminds you of your life goals. Another popular term for it is dream board. Let’s look at three purposes of your dream board in more detail below. 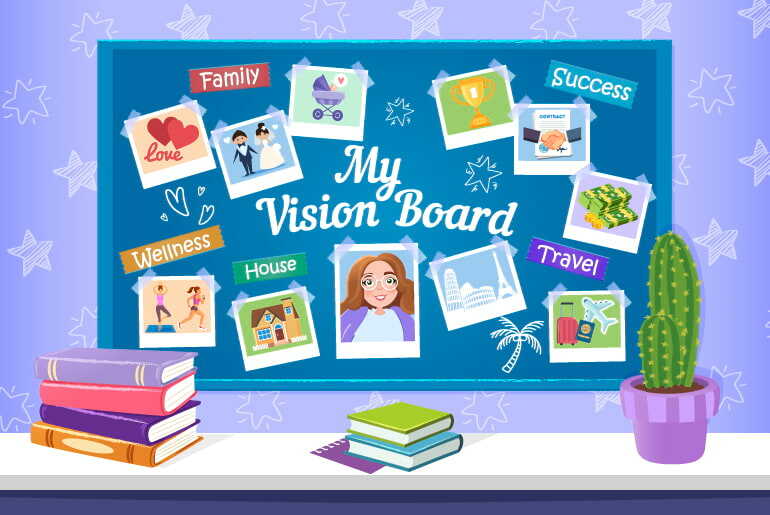 Visions boards force you to examine your desires and focus on those that truly matter to you. Whether creating one or several boards, the limited space forces you and empowers you to focus in on your most treasured desires. The process of choosing what to put on your vision board is simple yet meaningful. First, identify your wishes or desires, then select images that represent those desires. This simple selection process narrows down your focus and personalizes your board with specific messages that matter to you. For example, you might decide to put a picture of a house on your vision board because you want to purchase your dream home one day. But if you’re not satisfied with pasting an image of just any house on the board, you can find the perfect representation of your dream home or pick aspects of homes to collage them together into your perfect home. There is power in focusing on the details of how to represent your desire. The process of making those choices sends a very specific and personalized message to the universe about your desires. Without a doubt, it is the visual aspect of a dream board that really drives home your desires and sends a very loud, clear message. It’s easy to think that choosing and focusing on a desire helps achieve it that specific desre, but visualization isn’t as straightforward as we think it is. To understand why visualizing your desires is so powerful, we need to look at the brain. Our brain is an incredible machine that is geared toward making us successful with every action we take. Our brain trains our bodies to prepare for action — when we imagine ourselves preparing for an activity, our brains actually run through the process and send signals to the rest of our body to complete the action. If you’re still not convinced, check out this incredible story from the famous actor Jim Carrey about how daily visualization of $10 million led him to earn $10 million. It’s no secret that consistency is important. Whether attempting to learn a new skill or create a new habit, consistency is the key. We’re wired for repetition, and every time we repeat an action, we become stronger with that action. The wonderful thing about a dream board is that it only requires time and energy for the initial creation. After that, the consistency in the visualization happens every time you look at it. Feeling empowered to create your own dream board? It’s easier than you may think. Simply follow the steps below to prepare and execute what may be one of the most important things you can do for yourself. Start with the plan for your vision board. Take some time to thoughtfully consider the message you want your personalized board to convey and how you want your vision board to look. Before you begin, ask yourself the following questions and commit to the suggested action (your shopping list) to follow through with. a. What true wishes and desires do you want to reflect on your dream board? Make note of your answer before you begin selecting your images. b. Do you want one board or multiple boards for different areas of your life? Some people prefer to make several small boards to visualize several categories of desires, while others prefer to make one large board that encompasses everything desired. Keep in mind that you’ll need to place this board in a visible area that you see every day. For a small space, don’t buy a huge, poster board. If you’re picky about design and want your board to match your decor, consider that as well. c. What type of images will you use (printed or actual photographs)? And where will you source them from? Images are a major component of vision boards. For photographs printed from the internet and cut out from magazines, use stick glue, tape or hot glue. For precious items or photographs, buy acid-free, removable adhesive that is safe for photos. d. Decide on your vision board style — tidy board or messy board? Some people don’t mind haphazardly cutting out photos and glueing them to a board. Others prefer a tidy and neat board. If you’re fine with imperfect cutouts, stick to scissors. But, if you need perfectly cut out, intricate images, pick up an x-acto blade and a cutting mat for a much more enjoyable experience. Action — Add To Your Shopping List: Scissors or any other cutting tools. e. Adding embellishments to your board? Do you want your board to feature an affirmation (you might want stencils or letter stickers)? Do you want to add decorative elements so your board will fit in with your decor (maybe decorative tape or stickers)? Is there a certain kind of incense or candle you’d like to burn while you create your board? Make sure to have all the supplies on hand to make that happen. Action — Add To Your Shopping List: Write down additional supplies needed to make the board and the creation experience uniquely yours. With your shopping list in hand, go out and buy all the supplies you need. If cash is short, thrift stores and local “free” sites like Craigslist often have plenty of crafting supplies on offer. And gather your vision board images. Many people choose to use cutout magazine images, text or quotes for their vision boards. It’s fun to go through the magazines and find images that speak to you. You’ll need to either purchase magazines or find a way to get a stack of free ones. Printing images from the internet can use up a lot of printer ink. Keep that in mind when buying vision board supplies. Creating a vision board is a special ritual. It’s a time to get in touch with your true self, identify your true desires and focus your energy on attracting them into your life. 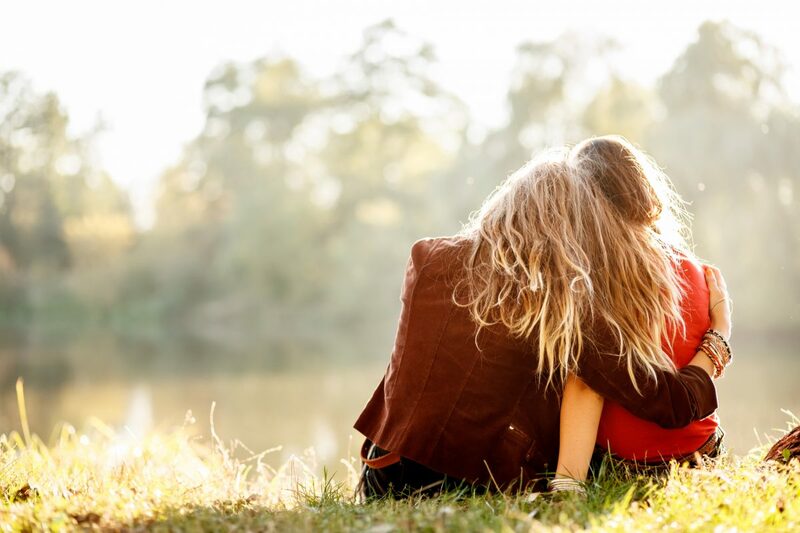 Treat this moment as something special, as something kind you’re doing for yourself. Find an uninterrupted, quiet space — This is your own time and your own experience. A vision board is all about you and what you want for your life. Make sure you’ve got a few hours all by yourself to really focus on this special gift. Set out all your supplies — To ensure uninterrupted creativity, double check that everything you need to create your vision board is on hand. Don’t forget the extra glue sticks! Light some candles or incense — Our sense of smell is very powerful and delightful, remember to engage it. Use your favorite oil burner, perfume, lotion, candles or incense to invite a welcoming and soothing energy to the experience. Turn on some music — If there’s a certain artist or style of music that really lights up your soul, go ahead and play it. If you get distracted by lyrics or think the content of certain songs will influence you, then find some nice, instrumental music to play. Tibetan chants, singing bowls and even nature sounds can bring on a sense of comfort and peace, setting the mood for the experience. Meditate or say a prayer before you begin — If you often ask God, spirit guides, source, the universe, your higher self, or angels for help, go ahead and say a prayer and call in those energies to empower your experience. It also helps to meditate; take some time to sit quietly and check in with how you’re feeling. Let go of all your worries about the day. This moment is all that matters right now. Here is science-backed guided meditaiton to help improve your creativity! For this step, let your creative power shine. It’s totally up to you whether your board is simple and literal or complicated and metaphorical. Cut out your images and tell a story with your board or create a collage of images that speak to you. What matters is that the images mirror your desires. When you look at the board images, you should feel a strong connection to those desires. Take time to cut your images out. Sit with your images for a moment before you attach them to your board. Hold them in your hand and stare at them. Feel the desire running through your body. Notice what emotions arise when you think of that image and the desires that it conjures. See yourself getting what you want and feel the happiness radiating from it. Whatever you’re feeling in this moment is exactly what you want to experience every time you look at your vision board. Once you’ve created your vision board, place it in an area that you see every day. Many people like to notice their vision board near their nightstand or other place that they look at first thing in the morning. After a time, and to avoid “not really seeing” your vision board, make a positive habit out of sitting with your board at least once a week. Simply take 10 minutes to look at your board, reflect on why you specifically chose those images, and revisit the feelings of happiness and gratitude of eventually having those desires in your life. Not only is a vision board a wonderful reminder of what you truly want in life, it’s a powerful motivator to enact on achieving your goals. Treat your vision board like it’s sacred — it’s a special gift you’ve given to yourself, and a powerful tool to attract all your desires into your life. Do you have any vision board tips you’d like to share? Please tell us about them in the comment section below.